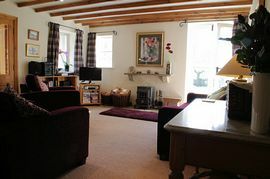 Cowlingholme Cottage is a delightfully converted detached stone cottage situated behind the main street of this busy village. At the side of the cottage is a walled gravelled parking space, with gated access to a flagged patio and large walled garden to the front of the cottage that faces south towards the steep distant fells of Addlebrough. A flagged pathway at the other side of the cottage also leads to the garden and accesses the main entrance which gives way to a very comfortable lounge with beamed ceiling, multi fuel stove on a flagged hearth and french windows that lead to the patio and garden. Off the lounge is a bright and well fitted kitchen with adequate space for dining. A pine balustrade staircase, with under stair utility cupboard, rises from the lounge to access two bedrooms and a shower room with toilet, washbasin and shower. One of the bedrooms has a double bed, large fitted wardrobe and vanity unit and the other two single beds and a lofted ceiling with an opening rooflight. The charming and meticulous conversion, enhanced by tasteful decoration and fine furnishing provides a most welcoming light cottage with an excellent standard of accommodation. Pleasant views across the valley. Comfortable lounge with beamed ceiling and multi fuel stove. 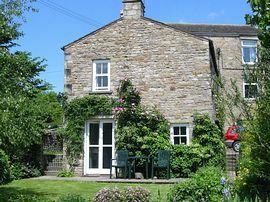 Double bedroom at Cowlingholme Cottage in Askrigg. 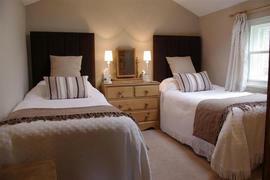 Twin room at Cowlingholme Cottage in Askrigg. 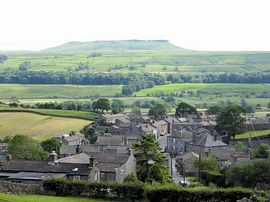 Looking over the rooftops of Askrigg towards Addleborough. 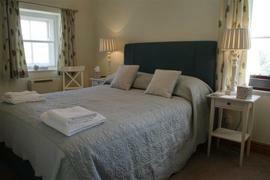 King size duvet and two singles, linen and towels all provided. Garden furniture and barbecue, lockable bicycle store. Local Services: Shops, pubs, restaurant, bus route 250 yards. Precise directions to the cottage will given at time of booking. Prices are from: £358.00 Low season to £645.00 High season.